Swrve’s campaign builder now includes our own customizable email service. Enhance your mobile marketing campaigns with personalized emails that nurture prospects, create positive customer experiences, and build long-term relationships. Create personalized emails that stand out from a packed inbox with Swrve Email’s easy to use content editor. Select from a preconfigured campaign template, a variety of basic layouts, or directly upload HTML. To add or edit the content of your Swrve Email campaign, on the Content block, select add + or edit . Swrve Email is currently available as part of our Early Access program. To have this feature enabled for your app, contact your CSM at support@swrve.com. Email details is where you enter the sender, recipient, and subject information for the email. To include custom properties with any value, select Insert property . Select a template from your library of preexisting templates. If you selected a campaign category, the Saved templates section displays all templates linked to that category. Select a predefined layout for adding content to your email. Reuse the content from emails that you built and sent using Swrve email. 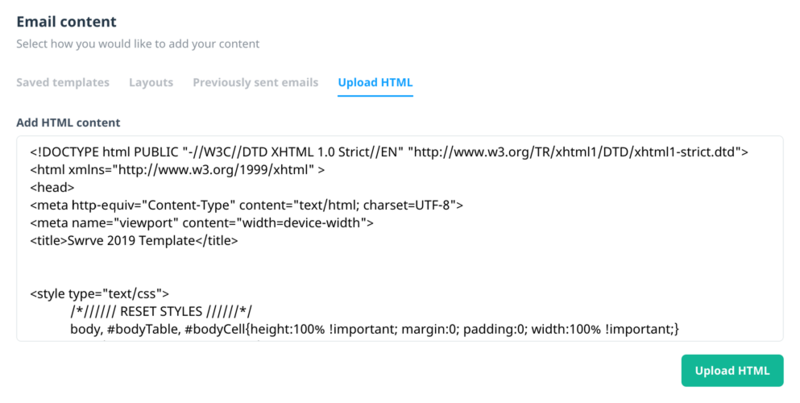 Upload your email template as HTML, generally from another email editor. If you are using this option, use well-defined HTML that includes all the elements required to display the email in a browser. Note, this option is not a code editor. To edit the code of your email template, use the Editor icon within the template editor. 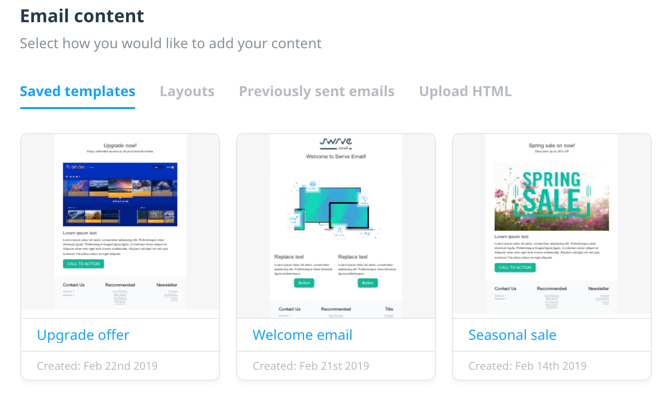 After you select a template option, the email editor displays the template you selected and gives you the same options for adding and editing the template content that are available when you create a new email template (for example, appearance, structure, blocks). For detailed information on how to edit the content of your email, see [Creating and managing email templates]. When you’ve finished customizing your email content, select Save & exit to return to the Content screen. The Email content section displays a preview of your email and includes a plain text editor where you can insert custom properties and plain text content as needed. When you’re happy with the email content preview, to save the content and return to the campaign build screen, select Save.